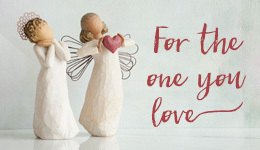 This special Willow Tree® angel figurine holds a single red rose with slightly tilted head signifies a love, pure, and simple. Personalize with a first name written in a vertical presentation along her skirt. Includes gift box and ready for gift giving. Easy care: Dust with soft cloth or soft brush and avoid water or cleaning solvents.